… we must cease descending to the masses. Indeed, we must precede them. Carlos Taibo recently defended the need for a nation or iberian wide anarchist organisation to unite, consolidate and give greater resonance to anarchist activism (click here). This latter is weakened by dispersion, above all in the face of more organised movements or political parties that endeavour to absorb and assimilate grass roots social movements grounded in direct action. If the context for Taibo’s intervention is spain, similar appear to have surfaced in greece. And Syriza and spain’s Podemos, are perhaps on the “left” the immediate menace to a politics of generalised autonomy, for they present themselves as the representative voices of social movements. In spain, this idea gains concrete expression in something that has came to be called Procés Embat, originating among catalan libertarian in 2013, and today engendering similar initiatives elsewhere. Procés Embat is a network of social militants of the libertarian tradition, who have started with the objective to articulate a social trend, organised and willing to contribute to, from a libertarian perspective, the development of the popular movement and the empowerment of the people to achieve a sovereign Catalonia through the development of popular power for greater economic and political democracy. If we raised questions regarding Taibo’s proposal, it was not to dismiss it (click here). And our attitude remains the same in this instance. Below, we publish in translation an interview accorded to the CNT newspaper by militants of the initiative, to further clarify views and positions. But is the movement in fact disorganised? Or is its dispersion not a sign of its intrinsic plurality, rather than a symptom of disorder? And what is an anarchist organisation beyond relations of affinity? (For a discussion of anarchism and friendship, click here). Is there not a danger here of institutionalisation, bureaucratisation, in sum, vanguardism? If an anarchist group or movement engages in a politics of creating autonomy in the here and now, that autonomy is inevitably plural. And what organisation is necessary will presumably come from within the plurality according to felt needs and desires. Is not then the effort at organisation on a national scale the effort to give a unity where not only is there none, but where it is not seen to be possible or necessary? Again, these questions are not intended to be read as a rejection of the initiative. There are more than enough reasons to be interested in it, and thus our concern. But the hesitations, the doubts, are born of ideas expressed not only today, but by older controversies. We may conclude by citing Gustav Landauer. … this is yet another crucial fallacy: that one can – or must – bring anarchism to the world; that anarchy is an affair of all of humanity; that there will indeed be a day of judgment followed by a millennial era. Those who want “to bring freedom to the world” – which will always be their idea of freedom – are tyrants, not anarchists. Anarchy will never be a matter of the masses, it will never be established by means of military attack or armed revolt, just as the ideal of federalist socialism will never be reached by waiting until the already accumulated capital and the title of the land will fall into the people’s hands. Anarchy is not a matter of the future; it is a matter of the present. It is not a matter of making demands; it is a matter of how one lives. Anarchy is not about the nationalization of the achievements of the past but about a new people arising from humble beginnings in small communities that form in the midst of the old: an inward colonization. Anarchy is not about a struggle between classes – the dispossessed against the possessors – but about free, strong, and sovereign individuals breaking free from mass culture and uniting in new forms. The old opposition between destruction and construction begins to lose its meaning: what is at stake are new forms that have never been. 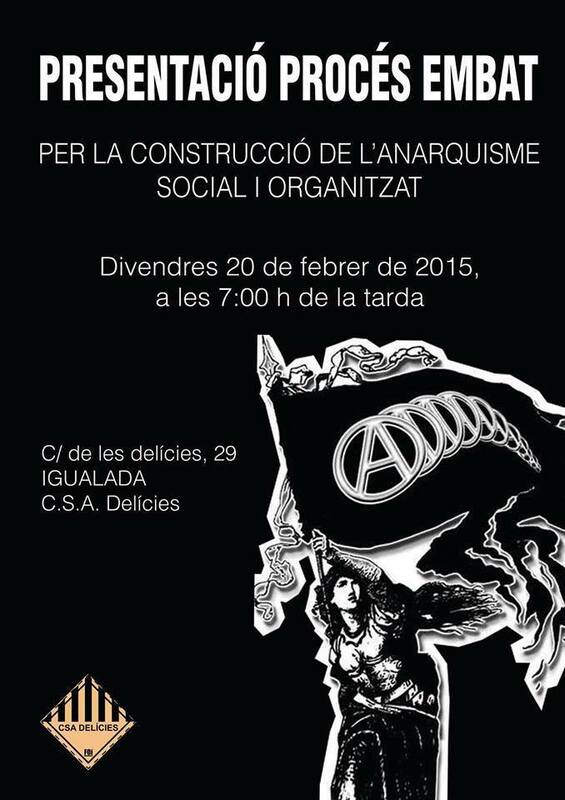 Procés Embat presented itself recently in society with the intention of articulating an organised anarchism. In the following interview, they tell us of their vision of the current libertarian movement and their intentions with this new project. Question. – How does the Procés Embat arise? Why this name? Response. – Those of us who initiated this Procés Embat felt the necessity of articulating an organized response to the problems of our society in our time. That is to say, to escape from the typical finalisms of revolutionary ideologies and apply our values here and now in an organisational process centred in the social sphere. We met many who had abandoned the movement, or were in the process of doing so, dispersed in numerous social platforms, movements and organisations, sometimes unrelated to the libertarian. It was a matter of re-establishing contact with these people and to continue contributing to their own struggles, but working from a libertarian perspective, for in spite of the distance we noticed that they continued to work within our own desires. Embat means blow, or shock, in English, like the shock of a wave against a rocky shore. We believe that the name graphically captures what we wanted to mean, as much for the current libertarian movement as for the social movements. Q. – We speak of the need for an organised anarchism. But does it not already exist? R. – Anarchism is not organised. It tends towards organisation, but it is not. Relative to the social sphere, it is organised uniquely in anarcho-syndicalism. But beyond that, the movement is profoundly atomised, with each one acting very much in her/his own space, without their being the possibility of responding as a movement. We believe that we are still in a stage of collectives and not of organisations. That is to say, that those who consider themselves libertarians became disorganised or organised by personal affinities (and not on the basis of political positions), active in small collectives of a local ambit. Some dedicate themselves to cultural activites, others to managing a space (cultural associations and social centres), others to their neighbourhood and others to social questions. There are however more general ambits of work, such as for example, how to give a libertarian response to the TTIP (Transatlantic Trade and Investment Partnership), how to intervene in the issue of housing, what response do we have as a movement to health, retirement pensions, education, unemployment, etc. These are matters that concern us all and the responses that we offer are fragmentary and even at times contradictory. What work is pursued in this direction is not the outcome of efforts on the part of the libertarian movement, but of the organisations of social movements, with the exception of anarcho-syndicalism. We therefore believe that it is necessary to generate this space which presently does not exist. At present, there exist ever more coordinating bodies of collectives and groups. We think that it is a step forward in the direction of constructing organisations. Nevertheless, we do not believe that it is a solution. We have in fact participated in various efforts at coordination. All failed for the same reason: the absence of shared political positions. Each group thought differently, and even within each group there were divergent positions and this made it practically impossible to arrive at agreements of any importance. Whatever positive that emerged would remain at the level of creating newspapers, making posters, organising campaigns, calling for demonstrations and little more. Of course, this coordinating activity served to meet new comrades, to see with whom you can work and to initiate lines of activity. But having reached this point, we believe that we have arrived at the moment of organisations, in the plural, depending on different tactical and strategic positions or the way of functioning. Q. – Is there any experience at the national or global level that has motivated you to set out on this process? R. – Nationally, there are very few. The greatest influence upon comes comes from the social anarchism of Latin America, represented by the FAU (Federación Anarquista Uruguaya) of Uruguay and the FAG (Federação Anarquista Gaúcha), of Rio Grande do Sul (Brazil), and the long list of organisation that they have generated in the last decade. But despite that, we do not follow them to the letter. We want as our point of departure a close territorial reality. Consequently importing models from the past or from other territories makes little sense. In fact, we find greater inspiration in the social and popular struggles of Chiapas, of Oaxaca, of the peasants of Columbia, of Kurdistan, in the student movement of Chile, etc., than in the local or international libertarian movement of the last years. Our movement must be adapted to the times, to the organisational traditions and to the struggle of the territory. Q. – Why until today are anarchist ideas far from, no longer of acquiring relevance, but of winning sympathy in society? R. – We don’t think that we give rise to excessive antipathies; on the contrary, many people approach us who find in a utopian movement. And this is what is sad, that we don’t give the feeling that one day we could realise our end goals and sometimes we also give the sensation that we don’t believe that we can either. During approximately three decades, the libertarian movement lived closed in upon itself. First in anarcho-syndicalism and its internal conflict, after in the counter-culture and the okupation movement. In each domain, anarchism was too weak to provide a response to the problems of society. But we believe that we have traveled far. The atmosphere is not as strained as in other times and there are many libertarian people who became active in the last years, with a profound change that is noticeable in the movement. It is then from optimism, humility, militant work, openness, direct contact with social struggles, that we can again gain the sympathies of society. R. – 15M is the confirmation that an important part of society has affinities with libertarian ideas. But to have an affinity is not to be a libertarian; it does not have to want the final goals of anarchism. That was the task of the libertarian movement. Anarchist ideas impregnate the fabric of struggles, but there is always someone who tries to appropriate them as if they belonged to their own tradition. It is like the old revolutionary syndicalism that was created at the margins of Marxism and anarchism, and that thanks to the work of very many libertarian activists it ended up being a movement associated with anarchism. In this case, we have to think that movements are not neutral; that in all of them are activists from all of the political parties and that each has their own agenda. Ours is to have social movements be autonomous, independent of parties. And having attained that, we are succeeding, in that in the future this movement will be an ally of the libertarian movement. Q. – Do you believe that the libertarian movement has in recent times sinned due to an excessive dogmatism? What are the principal weaknesses and strengths that you see in it? R. – The dogmatism of the libertarian movement we see confirmed in its excess of ideology. In the face of any problem, a collation of principles is reached for. And the principles often impede action in conformity with what reality demands. Accordingly, we want to centre ourselves in practice. A practice based on principles, of course, but also a strategy to attain some objectives. That is why our organisation will be comprised of activists, of persons who militate in movements and who share in the daily struggles of society. That is, we speak of anarchism as a socio-political movement and not only as an ideology. To close oneself in the ideology has been above all an excuse to avoid a reality that was to us adverse. As everything which surrounds us is contrary to our principles, we don’t act and we criticise from our spaces, from within our spaces of comfort. We believe that we have to break with this dynamic and confront the problems that surround us, even equivocally if necessary. Anarchism is a tool for liberation and if it ceases to be so, then it will be no more than a pose. Q. – What opinion do you have of political organisations such as Podemos or Ganemos [a series of radical political municipalist movements seeking power at the local city level. In some cases, they have allied themselves with Podemos for the upcoming spanish municipal elections. For example, Ganemos Madrid] ? They have in same way taken our territory? How do we recuperate it? R. – They are expressions of discontent in society. Before the lack of evident victories in the street, people move towards electoral politics. In this case, new versions of a parliamentary left appear. The libertarian of course opposes the electoral game as the easy solution and denounces that electoralism forgets what is truly important: to empower the people. We do not believe that one can attain a great deal through the institutions, given that those who hold power in this country are the capitalists, and not those who govern. Local governments have relatively limited power and what they can realise will be meagre. But neither will we remain with our arms crossed and letting a moment pass without struggling, without carrying with us the demands of people to their end and also proposing new, more ambitious, ends. Power should be in the streets, and that is our role: to help organise society. Q. – You present yourselves as ambitious … What objectives would you like to reach with this initiative? What will be the stages to attain them? R. – Let us make it clear that for the moment we are a process of organisation and not an organisation formally constituted. This occurred when different groups that constitute Embat so decided. We have a long journey before us, but recently we have noticed a significant acceleration. In any case, what must grow is not our organisation in itself, but the influence of our ideas and our ways of acting within the social and popular movements. If we can count on some well politicised and autonomous social movements, and furthermore organised between them, we will have something like an organised people. The role of organised anarchism should be that of catalyst and motor of initiatives and that of avoiding the recuperation of struggles by other political movements. At that moment, we will be in a new stage of struggles in this country. Another interview can be found in Periodico Diagonal. Aprenent a entendre el que em rodeja...amb empatia.